In late May 1888, during his stay in Arles, Vincent van Gogh visits Les Saintes-Maries-de-la-Mer on the Mediterranean. Elated, he describes the colour of the sea to his brother Theo as being ‘like mackerel, in other words, changing – you don’t always know if it’s green or purple – you don’t always know if it’s blue – because a second later, its changing reflection has taken on a pink or grey hue’. He stays for a few days in the fishing village and in that short period makes nine drawings, two paintings with beach scenes and seascapes with fishing boats and this painting of Les Saintes-Maries-de-la-Mer itself. The rows of cultivated plants (possibly grapevines and/or flax) lead to the village with the church at its centre. 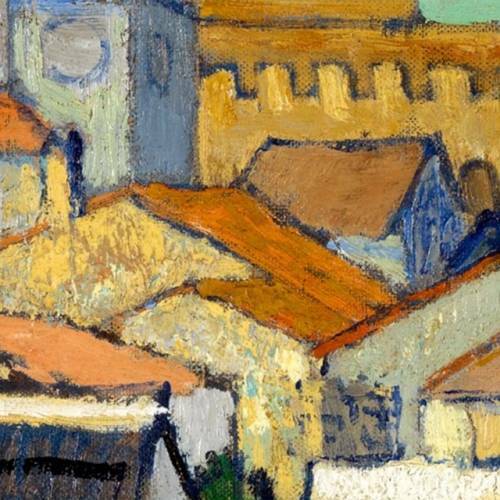 Van Gogh depicts the houses built close together with surfaces in different colours. The sides of the houses facing the sun are painted in warm and light tints, and the shadow sides in blue. Apart from the rows of cultivated plants, the painting is dominated by the ‘green blue of the sky heated white-hot’, as the artist describes the light of Provence in one of his letters.